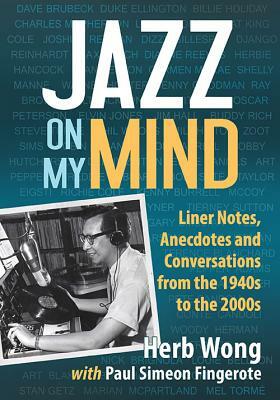 Sunday, August 7, 2016, 2:00 p.m.
Come celebrate the rich jazz history of the Peninsula when radio host Paul Simeon Fingerote joins us to celebrate the publication of Jazz On My Mind. This book is a spectacular memoir detailing the star-studded life of Dr. Herb Wong, an internationally acclaimed expert and a disc jockey on San Francisco’s KJAZ radio station for more than 30 years. Come share legendary stories about artists like Dave Brubeck, Duke Ellington and Billie Holliday. Dr. Wong’s co-author, Paul Simeon Fingerote will be presenting photographs, recordings and stories about his friend and these legendary jazz musicians. We’ll also be joined by student musicians who are continuing to uphold Dr. Wong’s legacy by playing legendary compositions taken from the book. This event will feature live musical performances by Julian Lopez on keyboards and vocalist Jamie Zimmer. Trained in jazz, pop, funk and classical voice, Jamie Z is an award-winning vocalist who has opened for Herbie Hancock and Paula West and has performed at Carnegie Hall, SFJAZZ Center, and the San Francisco Conservatory of Music.